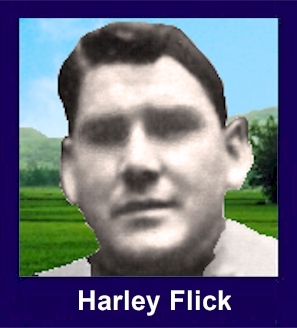 The 35th Infantry Regiment Association salutes our fallen brother, PFC Harley V. Flick, 33403124, who died in the service of his country on April 24th, 1945 in Luzon. The cause of death was listed as DOW. At the time of his death Harley was 25 years of age. He was from Pennsylvania. The decorations earned by PFC Harley V. Flick include: the Combat Infantryman Badge, the Bronze Star, the Purple Heart, the Asiatic-Pacific Service Medal, and the World War II Victory Medal. Harley was a metal processing worker in civilian life. He was single. He is buried in the Manila American Cemetery. "Klynstraw and Flick have died from wounds received a few days ago. They only lived a few hours. All of us feel this great loss. Both were good men. May their souls rest in peace, be it Gods will." "We have 79 men left now. We are nearly half strength now (full strength is about 185). We have lost 21 since receiving the 40 replacements on the hill to our rear." First Class Harley V. Flick, with whom we served for many months. As Harleys Company Commander I wish to convey my deepest sympathy and at the same time give you a few of the circumstances surrounding his death. On the morning of 24 April, our company was given the mission of securing a ridge and neutralizing Japanese forces thereon. This would enable us to establish contact with, and save, three men from the battalion wire section who had been cut off from our own forces early that morning. This ridge was approximately four hundred yards northeast of Kapintalan, Luzon, Philippine Islands. Harley was the first scout of the second squad of the leading platoon, the first platoon. He worked his squad around the left flank of the enemy, clearing four Japanese foxholes with hand grenades and establishing contact with the stranded battalion wire section men. He then worked his way in rear of the enemy and shortly after, was wounded by Japanese machine gun fire. Disregarding his wounds and safety, he rolled into position and silenced a machine gun which was firing on the first squad on his right. Such action enabled the platoon to secure the company objective. Harley was immediately taken to the battalion aid station, which was close by, and then on to a surgical hospital where skilled surgeons and the latest medical equipment was used to save his life. In spite of all possible efforts, he died 24 April 1945. I assure you that you can be justly proud in the knowledge that his actions were willing, loyal and courageous in making the greatest sacrifice a man can make -- his life for his country and his comrades. Harley was buried with full military honors in the United States Armed Forces Cemetery at Santa Barbara, Luzon, Philippine Islands. The Cemetery has been landscaped and rows of palm trees enhance its solemn beauty. We in the company feel his loss tremendously, not only because he was an outstanding soldier but because of his cooperative spirit, jovial manner and ready smile. Harley held the respect of all the officers and men in the company. During the months that I knew him, he was always a fine gentleman. Feel free to write at any time for any additional information or help that we may be able to furnish.